Today is officially the start of Shark Week! Do you usually catch the series on the Discovery Channel? 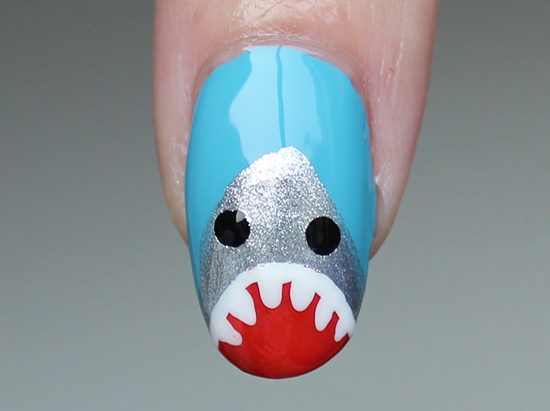 Will you be sporting shark nails? 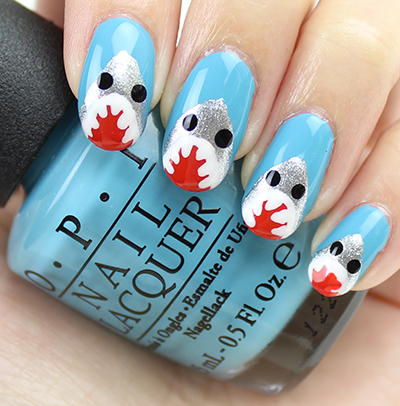 Since I had wanted to do some nail art, Shark Nail Art seemed appropriate now. 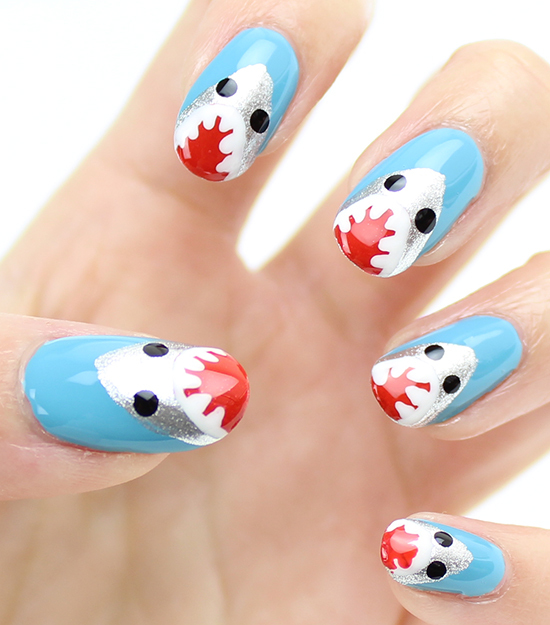 You can just do one shark on an accent nail, however, whenever I do freehand nail art, I enjoy painting all my nails because it gives me more practice, and I love seeing the variations from nail to nail – the human touch. 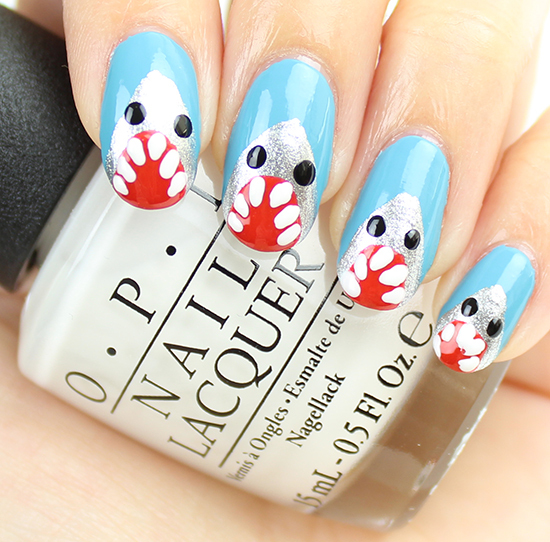 In this post, I share with you swatches of this look, and then further down, I show you step-by-step with photos and written instructions how you can easily recreate it with my Shark Nail Art Tutorial. 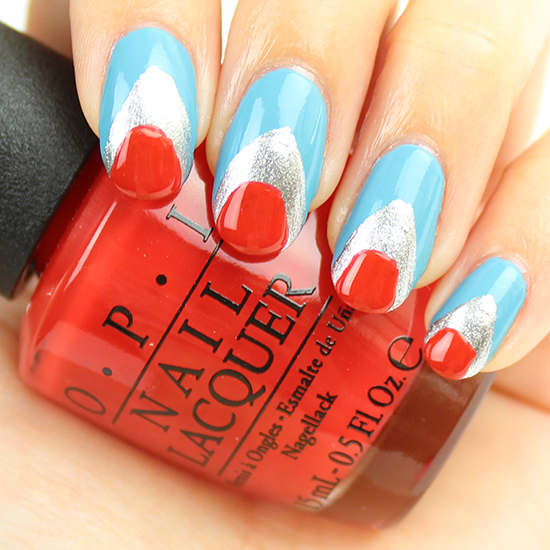 Hope you enjoy this freehand nail tutorial! Hehe, look at the baby shark on my pinkie finger. He’s a bit of a messy eater! 😉 Makes me laugh! Note: I purchased the base coat, as well as the brushes. The OPI colours and dotting tool were provided by PR in the past. 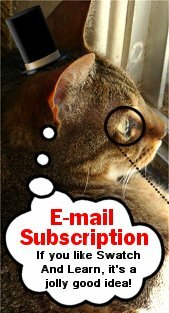 (The ones I’ve reviewed in the past have links to the individual posts.) The KBShimmer top coat was provided by Harlow & Co.
You don’t necessarily have to paint your nails blue. Use whatever colour you have that will contrast against the other shades. You can paint these using the brush directly from the bottle, but I wanted to create some guidelines first. 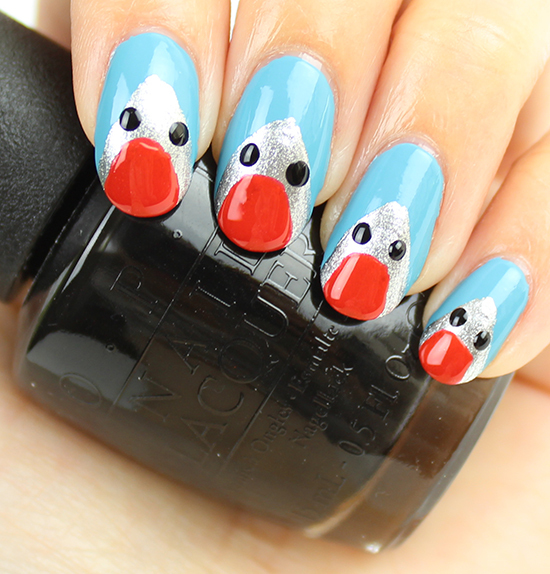 To do this, I used a nail art brush to draw a triangle with the tip pointing towards my cuticles. Then, I took the regular brush from the silver polish to fill it in. You could use a grey, creme nail polish, but I wanted extra dimension, so I went with a blingy, sparkly silver, OPI My Signature Is “DC”. It’s from the Coca-Cola Collection. 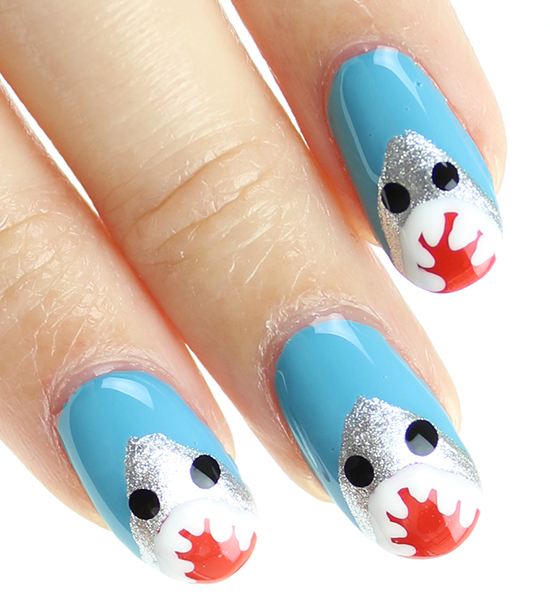 Tip: If you use a creme base colour, you can make your sharks sparkly. 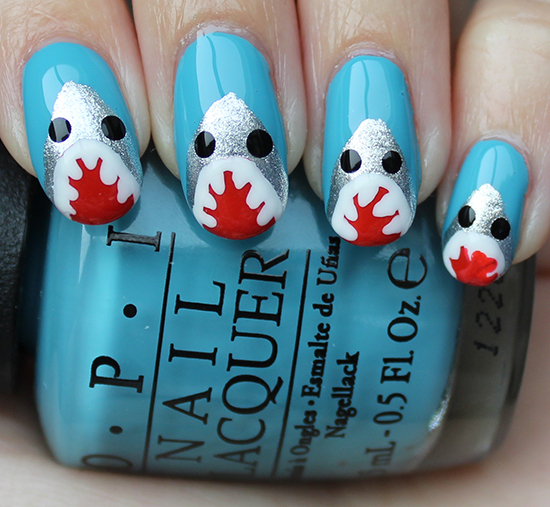 But, if you used a glittery or sparkly base colour, I recommend using a creme for your sharks. Using this rule of contrast will help your design show up better. Using a red (preferably a red that’s bright, not vampy), use the brush from the bottle to paint mouthes in semi-circles near the tips. I used OPI I STOP for OPI, which is from the Brights 2015 Collection. Here’s the really fun part because you can be really messy! Placing some white nail polish onto the piece of foil, I then dipped my OPI dotting tool into it. I then touched the dotting tool onto my nail and then dragged slightly to make teeth all along the mouthes. Tip: Instead of a dotting tool, you could also use a nail art brush. However, if you’re like me and have shaky hands, I suggest using a dotting tool because you’ll have greater control. The white nail polish I used was OPI Angel with a Leadfoot, which is from the OPI Ford Mustang Collection. I used a nail art brush dipped in the same white nail polish to line the mouthes. Before adding your top coat, make sure that you wait a long time because you don’t want to smudge the design and ruin all your hard work! I put on the KBShimmer Clearly on Top Quick Dry Top Coat after about 50 minutes, which seems like a long time, but with all the thick layers of nail polish, I didn’t want to risk smudging it at the last moment. Are you into Shark Week? 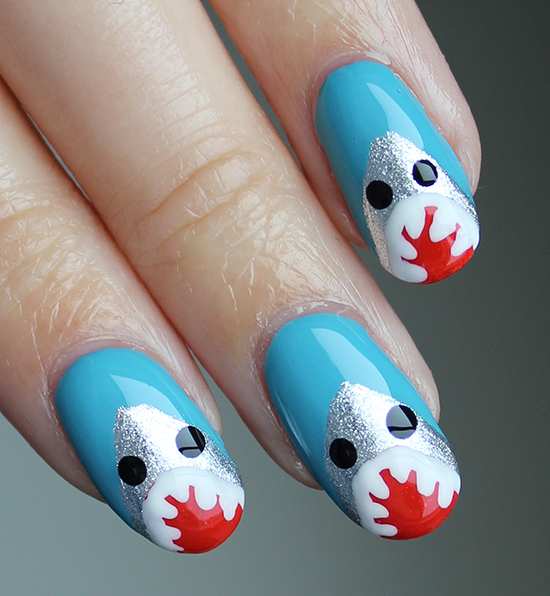 Would you wear these shark nails? What are some freehand designs you’d like me to try my hand at? This entry was posted in Nail Art, Nail Polish Swatches & Reviews, Product Reviews, Tutorials & Tips and tagged OPI on July 5, 2015 by Mary S.. 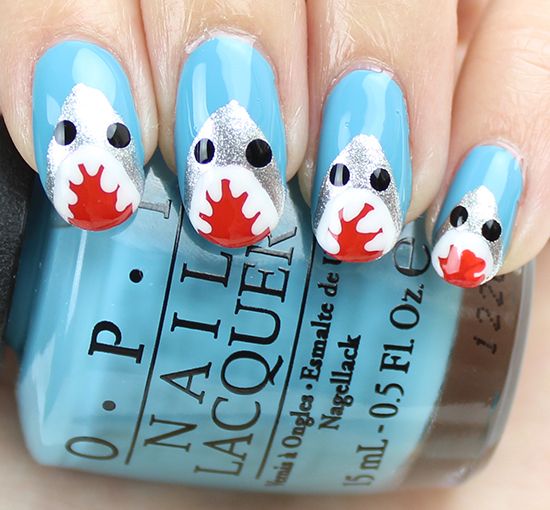 This looks so cute (although sharks and cute may not necessarily go together). Too cute!!! I love this design. I think I’ll be giving this one a try. It’s really easy, and you’ll keep smiling whenever you look down at your nails. 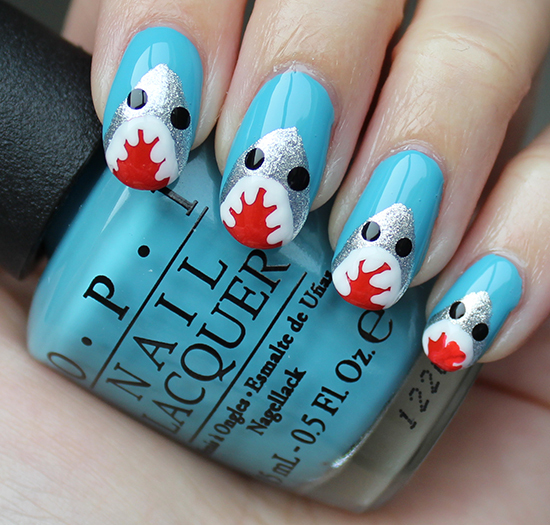 Shark nails are fun, fun, fun! So fun, and great tutorial!!! Thanks for checking out my tutorial! 🙂 It’s such a simple and quick nail design to do, and I enjoyed wearing it! 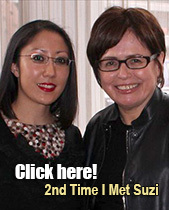 That means so much to me, and, by the way, thank you for sharing my tutorial on Twitter! 🙂 I saw it earlier today. 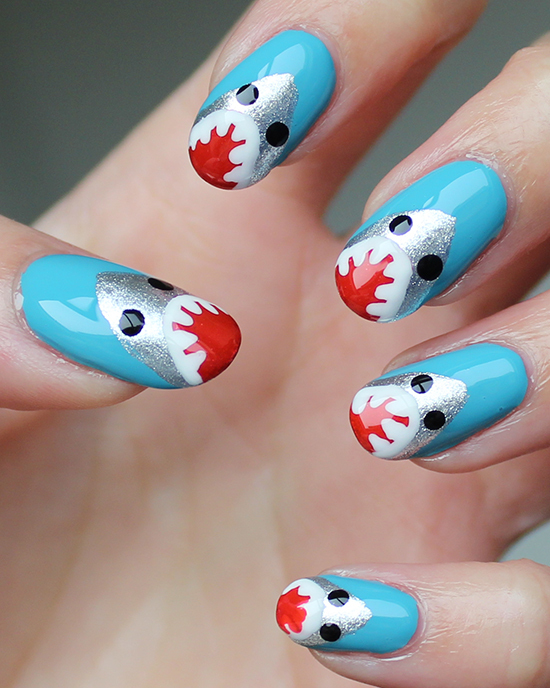 When you try the shark nail art, please tag me because I’d love to see yours and how you put your personal touch on it. 🙂 It inspires me! Dun dun dun dun…. stay out of the water! These are cute. 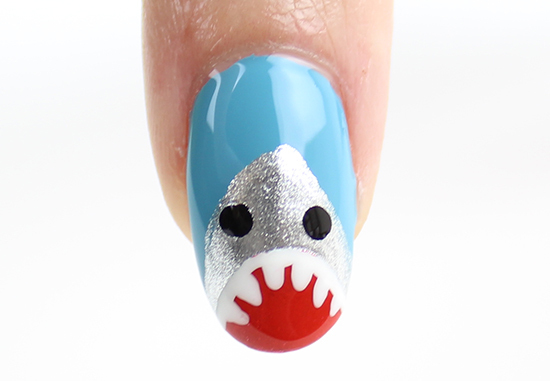 Better than Katy Perry’s Left Shark. I’ve never watched shark week on the discovery channel. 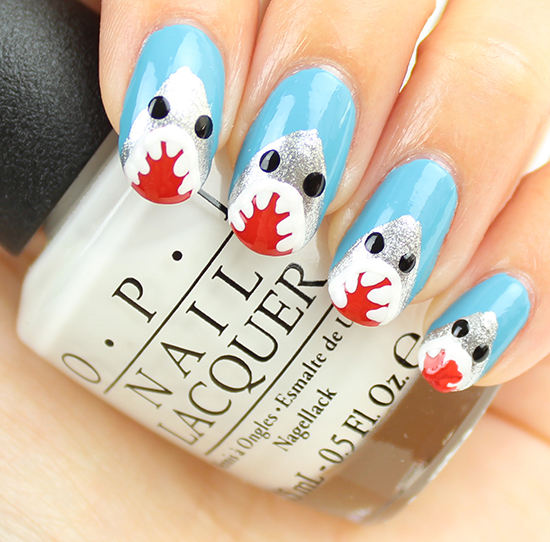 Your sharks turned out awesome and would definitely wear them on my nails! The baby shark is adorable! You really should! It doesn’t take long at all. Just watch your favourite TV show as you do it, and you’ll see how quickly you can get it done!